Exterior Commercial Painting, Charlotte, NC | Pride Painting, Inc. When you hire us for exterior commercial painting, we’ll provide you with a solid three-year written guarantee. Managing or owning a commercial facility comes with a number of necessary tasks. Building upkeep and maintenance may not always make it to the top of the priority list, but these aspects are important to make sure your facility is always looking its best. Over time, the paint on the exterior of the building can start to peel and fade, making the structure look worn-down and less appealing. When you have clients, customers, or even potential new hires visiting the facility, the way it looks can impact their first impression. If they spot a worn-out building that isn’t well-maintained, they may wonder whether your business can take care of their needs. At Pride Painting, Inc., we offer exterior commercial painting services to eliminate this problem for commercial facilities in the Charlotte, North Carolina area. We have been serving the commercial community for more than 14 years and our painting team has 30 years of combined experience. When you hire us for exterior commercial painting, we’ll provide you with a solid three-year written guarantee. 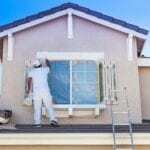 By turning over the task of exterior commercial painting to our experienced team, you can eliminate the hassle of trying to tackle a painting job yourself. We’ll bring the tools and equipment needed to apply a fresh coat of paint on the outside of your structure. Our team members also use high-quality outdoor-rated paint products that can withstand the climate conditions and continue to look good for years to come. Contact us today for more information about the painting services we offer.